25 March 1133, Le Mans, Anjou. Matilda (c. 1103/4 - 1167). 11 May 1152, Bordeaux Cathedral, France. 19 December 1154, Westminster Abbey. The only English Pope, Adrian IV, elected, 1154. Council of Woodstock, July 1163. Council of Westminster, October 1163. Constitutions of Clarendon, 30 January 1164. Thomas À Becket goes into exile, October 1164. Richard, Earl of Pembroke, invades Ireland, 1170. Henry, The Young King, crowned, 14 June 1170. Thomas À Becket returns to England, 1 December 1170. Thomas À Becket murdered, 29 December 1170. Henry II does penance at Avranches, 21 May 1172. Thomas À Becket canonised, 21 February 1173. Battle of Alnwick, 13 June 1174. 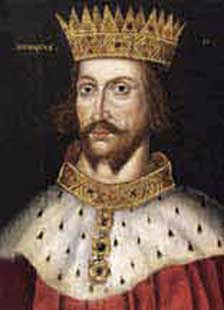 Henry II whipped at Canterbury, 7 July 1174. Treaty of Gisors, 28 June 1180. Pece treaty signed at Chateauroux, 1187.